This raw image from NASA's Cassini spacecraft was taken on March 28, 2012. The camera was pointing toward Saturn's moon Dione at approximately 49,087 miles (78,998 kilometers) away. NASA's workhorse Saturn orbiter Cassini has just beamed back stunning new views of the ringed planet's dazzling moons, including the probe's closest-ever pass over the ice geysers of Enceladus. The new photos reveal the plume of water ice and vapor that springs from the south pole of Enceladus — Saturn's sixth largest moon — as well as the pockmarked surface of Dione and the tiny oblong shape of Janus. Cassini made a close flyby of Enceladus on Tuesday (March 27), swooping within about 46 miles (74 kilometers) of the moon's surface. This moon is one of the few known geologically active places outside Earth in the solar system. This raw image from NASA's Cassini spacecraft was taken on March 27, 2012. The camera was pointing toward Saturn's moon Enceladus at approximately 144,281 miles (232,197 kilometers) away. The theory that an underground ocean of liquid water is powering this southern plume makes Enceladus a potential spot for the existence of extraterrestrial microbial life. "Though we've been in orbit around Saturn for nearly eight years now, we still continue to image these moons for mapping purposes and, in the case of Enceladus, to learn as much as we can about its famous jets and the subterranean, organic-rich, salty, liquid water chamber from which we believe they erupt," Carolyn Porco, leader of Cassini's Imaging Science team, wrote in a statement. Porco even suggested that the jets could be "snowing microbes" from Enceladus' buried ocean out over its surface. "In the end, it is the most promising place I know of for an astrobiology search," Porco said in a NASA interview. "We don't even need to go scratching around on the surface. We can fly through the plume and sample it. Or we can land on the surface, look up and stick our tongues out. And voilà…we have what we came for." Later on Tuesday, Cassini swung by Janus, coming to a distance of 27,000 miles (44,000 kilometers) above the small moon. Janus is so tiny that it hasn't rounded into a spherical shape; rather, it is more like a pile of icy rubble. In the background of some of the new Janus pictures, Saturn can be seen shining. This raw image from NASA's Cassini spacecraft was taken on March 27, 2012. The camera was pointing toward Saturn's moon Enceladus at approximately 19,810 miles (31,881 kilometers) away. Then, on Thursday (March 28), Cassini neared the medium-sized Dione at about the same distance of 27,000 miles (44,000 kilometers). 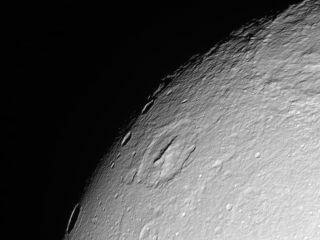 The probe was able to capture nine separate frames that mosaic together to illustrate the moon's heavily cratered far side, which always faces away from Saturn. Cassini, a collaboration between NASA, the European Space Agency, and the Italian Space Agency, launched in 1997 and entered orbit around Saturn in 2004. In 2005, it released the Huygens probe, which landed on the surface of the largest Saturnian moon, Titan. Cassini is set to make its next Enceladus flyby in a little over two weeks, on April 14. The probe's mission has been extended until at least 2017.